Including Jimmy Barnes, Magda Szubanski, Anthony Mundine, Kyle Sandilands and Dr Charlie Teo. "I love painting and I love great conversation with interesting people. And one day I thought, you know what, why not put the two together?" 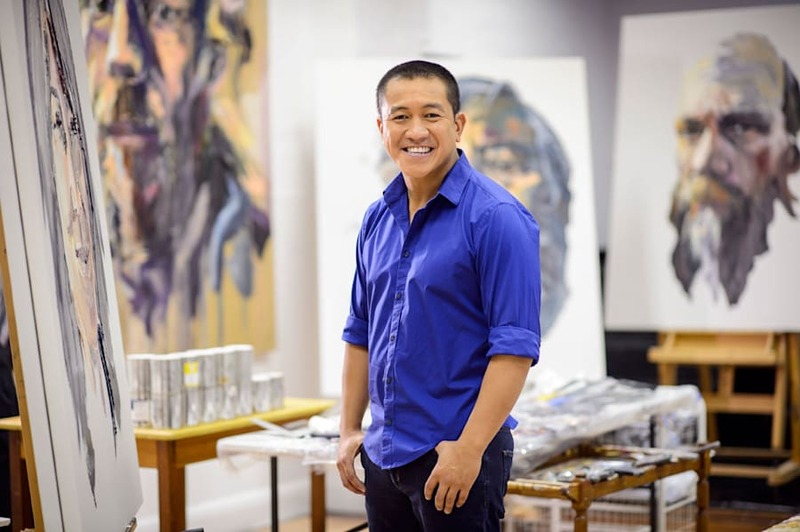 This is how Aussie comedian and artist Anh Do came up with the idea for his new show 'Anh's Brush with Fame', an eight-part series for the ABC in which Do paints the portraits of several Aussie celebs, interviewing them at the same time. And when we say celebs, we're not talking about the latest evictee from 'The Bachelor' (sorry, Keira). We're talking big names like Jimmy Barnes, Magda Szubanski, Anthony Mundine and even the legendary neurosurgeon Dr Charlie Teo. "I wanted to interview people I love and admire, people I find fascinating," Do told The Huffington Post Australia. "So I came up with a list of the eight people who are in the first series. "One of the best parts of the show -- actually, what I enjoyed most -- was how generous the guests were in opening up and sharing with me their stories -- a lot of stories they don't often share in the media." Anh Do, where all the magic happens. (His studio). "All of them told me something I'd never known about them," Do continued. "And I did months of research about each of them. "For instance, Kate Ceberano told me about her mum one day sitting her down and saying, 'when I was 16, I was pregnant and I gave the baby up for adoption. So you actually have a brother you don't know about.' And then Kate goes and meets this guy who is her half brother. "I was like, 'Jimmy, that's like 100 drinks!' and he said, 'yeah, it nearly killed me'. He ended up having to have heart surgery." Kyle [Sandlilands] is a lot of things but he's never boring. That's the criteria for me. When it's put to Do that his guest list is certainly varied -- for instance, the careers of Dr Teo and radio shock-jock Kyle Sandilands are hardly comparable -- Do says his main criteria for each guest was that they were interesting. "Kyle is a lot of things but he's never boring. That's the criteria for me," Do said. "Guests can't be boring. "A guest like Kyle is always going to be interesting. In fact, he was absolutely fascinating. When he was homeless he used to sleep at a service station, and at night he used to listen to the radio coming through the bowsers. Those human voices became his company, and that's how he fell in love with radio. "[With all my guests] I really want to talk, go deep you know," he continued. "I wanted to ask 'what's your life philosophy? What's your deepest regret? What's your greatest joy?' I wanted to go there." 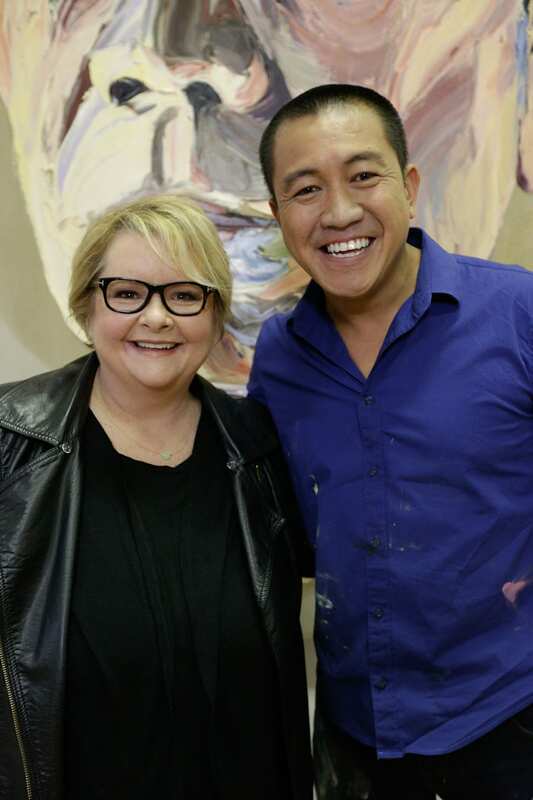 Magda Szubanski and Anh Do. Now for the really juicy question: what did everyone think of their portraits? "I'm actually really nervous before the reveal. I'm really nervous before I spin the painting around. I'm like the contestant on 'MasterChef' before Matt Preston takes the first bite. You know, I might have just had a great three hour chat to my guests, but then if they hate the painting, I feel terrible. "I pretend I don't care, but deep down I care. I care lots." 'Anh's Brush with Fame' premieres on the ABC on Wednesday, August 24th at 8pm.